This was the tone of discussions between Grenada’s new Minister of Foreign Affairs and International Business, Nickolas Steele and Ambassador and Permanent Representative of the Russian Federation to the United Nations, Mr. Vitaly I. Churkin. Minister Steele, who is on his first official visit to the United Nations, has been meeting and familiarising with top UN diplomats this week. Drawing on his International Business portfolio, Mr Steele informed the representative of the world’s largest country and the ninth largest economy (according to IMF 2012) that Grenada was interested in doing business with the Russian Federation. Grenada re-established diplomatic relations with the newly formed Russian Federation in 2002. 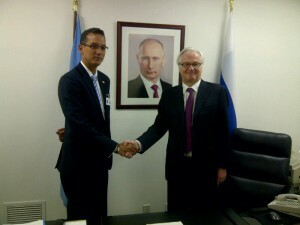 He invited Ambassador Churkin to re-visit Grenada beyond the cruise-ship stop he made some years ago. The Ambassador indicated that his country invests around the world. Ambassador Churkin, who is the current President of the Security Council, also briefed Minister Steele on the current agenda of the Council for March 2013, including its resolution on the Democratic Republic of Korea, peace-keeping work in Mali and other parts of Africa and the review of the UN’s mandate for Haiti. The Ambassador, who has been assigned to the UN since 2006, engaged Minister Steele in a discussion on Security Council reform where on behalf of CARICOM; Grenada has provided leadership along with India. The Ambassador advised the Grenadian minister that the Russian Federation was open to a careful consideration of all views on this difficult matter which has been debated for more than a decade now. The Minister was also received by the Chair of the largest negotiating group at the United Nations, the group of 130 countries in the “G-77 and China”, His Excellency Ambassador Peter Thompson of Fiji, who thanked him for Grenada’s leadership role in Alliance of Small Island States (AOSIS). Ambassador Thompson informed the Minister of the UN’s “Post 2015 Development Agenda”, including the global conference on Small Island Developing States (SIDS) to be held in the Pacific island of Samoa, September 1-4, 2014. Reflecting on Grenada’s role in AOSIS, Ambassador Thompson encouraged Grenada’s participation in that meeting to help set the priorities for islands as the world moves toward sustainable development in a concerted way. The Minister was urged to ensure Grenada’s participation n in the regional preparatory meeting in Jamaica in June. 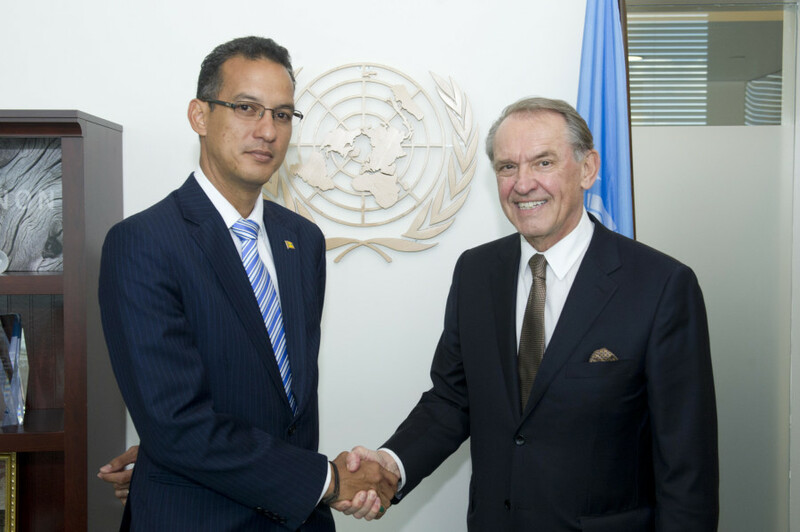 In a meeting attended by a number of political advisers and other UN personnel, the second in command at the United Nations, Deputy Secretary General Jan Eliasson welcomed Minister Steele. Mr. Eliasson, a former Foreign Minister of Sweden and UN senior official, expressed satisfaction that the administration of Prime Minister Dr Keith Mitchell has committed to multilateralism, saying that small countries often find the UN to be their first line of defence. The senior UN diplomat invited the Minister to identify special issues facing Grenada. Minister Steele said that Grenada was ready to play a strong role at the UN. He noted that energy exploration, debt forgiveness and achieving the UN’s Eight Development Goals by 2015 were among the top priorities of his government. The two leaders discussed water and sanitation, maternal child health, financing for development and climate change, partnerships for development and the importance of the rule of law and good institutions as in a nation’s progress. The Minister was accompanied by out-going Permanent Representative of Grenada to the United Nations, H.E. Ambassador Dessima Williams.